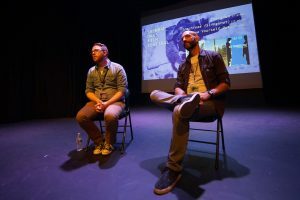 Q&A for “The Faceless Man” with director/co-writer Jeremy Foley and lead actor William O’Leary. 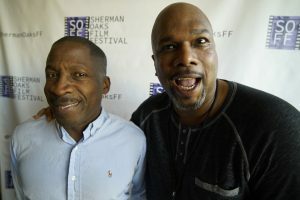 “90 Minutes of the Fever” lead actor Glenn Plummer and writer/director Michael Sean Hall. 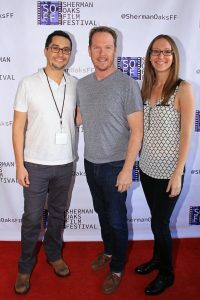 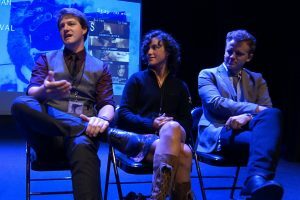 “The Faceless Man” director/writer Jeremy Foley, lead actor William O’Leary, and producer/writer/editor Sara O’Reilly. 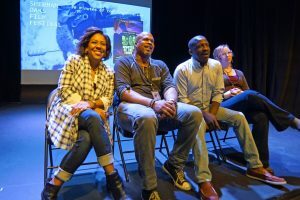 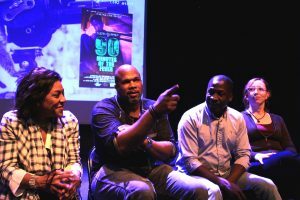 Q&A for “90 Minutes of the Fever” with producer Monica Cooper, writer/director Michael Sean Hall, lead actor Glenn Plummer, and producer Joan Carlson. 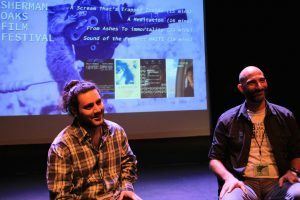 “A Scream That’s Trapped Inside” writer/director Savvas Christou. 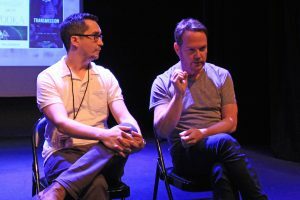 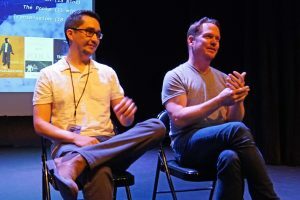 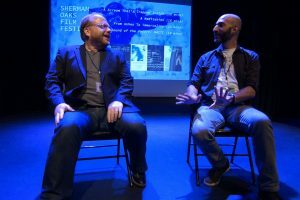 Q&A with “Chatsworth” writer/director La Monte Edwards and lead actor Michael Dearie. 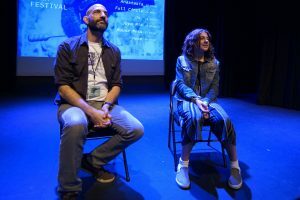 Q&A with “Holly’s Girl” director Paulina Lagudi and cinematographer Cooper Ulrich. 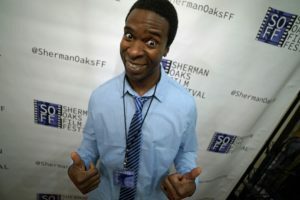 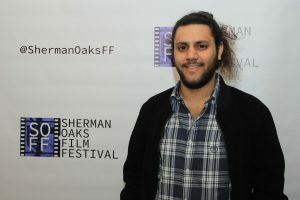 “Immersion” writer/director Mikhael Bassilli poses for the fish-eye lens. 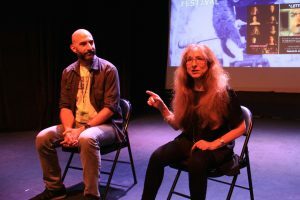 Q&A with “Joya Mia” filmmaker Ella Warren. 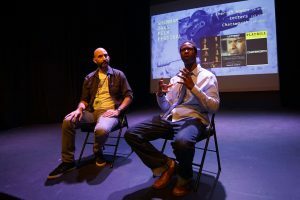 Q&A with “Letters” filmmaker Reggie Jernigan. 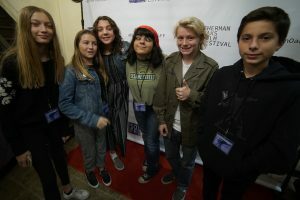 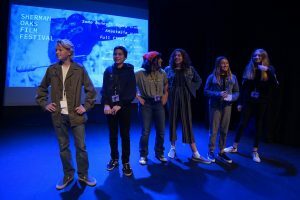 The filmmakers from CAAM, the Cinematic Arts Academy at Millikan Middle School: Miles McCrudden, James Labuda, Isabella Masrouga, Ella Warner, Ella Mazer, and Remy Boul. 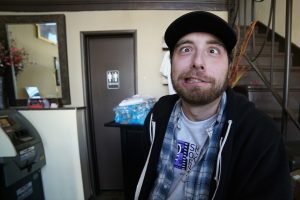 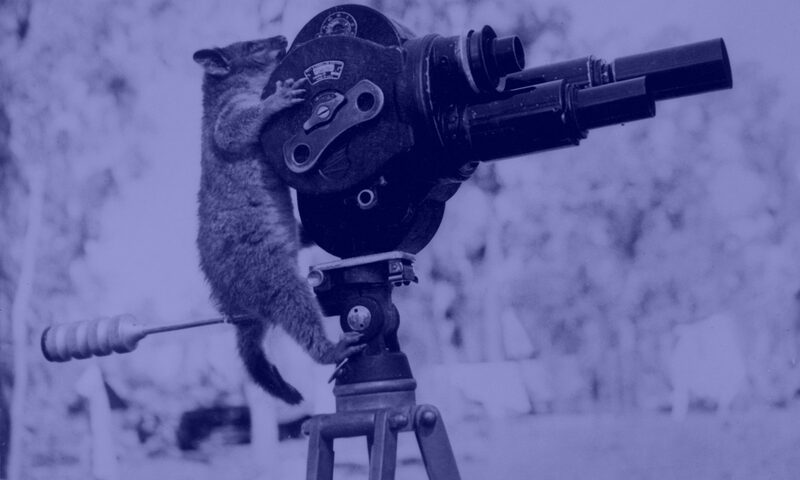 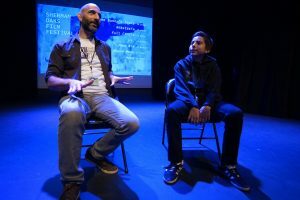 Q&A with “Mouse Mess” filmmaker Miles McCrudden. 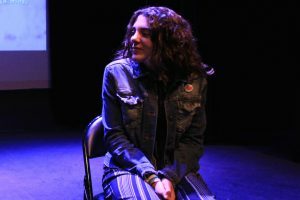 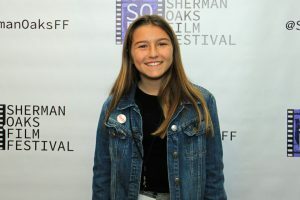 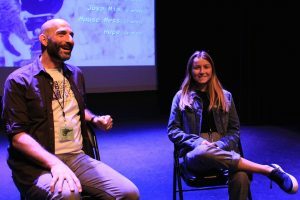 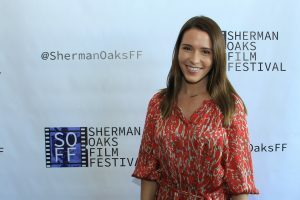 Q&A with “Some Bunny’s Story” filmmaker Isabella Masrouga. 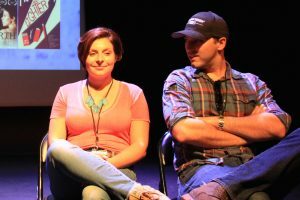 Q&A for “Stay” with writer/director Christopher Cramer, lead actor Devin Brooke and actor Blake Berlin. 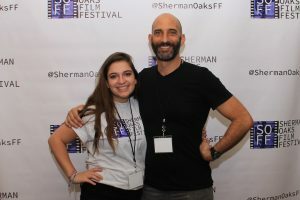 “The Faceless Man” sound designer/mixer Mike LaFerla with Christina Chiusano. 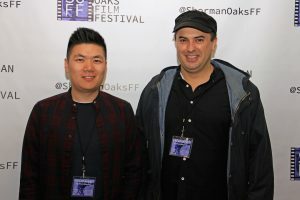 “Tirachinas” lead actor Emma Maddock, writer/director Pedro Patricio and fellow filmmaker Fei Yu. 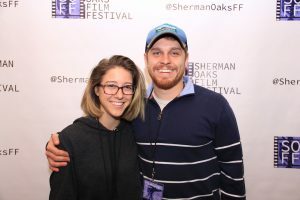 “Us.” director and animator Remy Boul with friend. 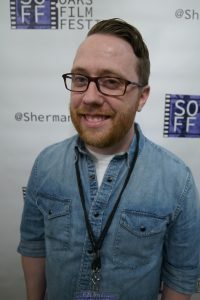 “Us.” director and animator Remy Boul. 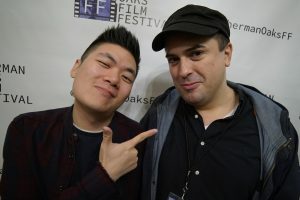 “Tirachinas” writer/director Pedro Patricio and fellow filmmaker Fei Yu. 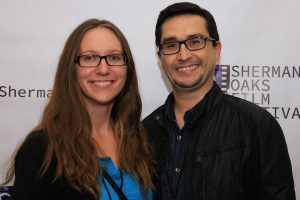 Alissa Dean, writer of “The Pooka,” with her handsome husband. 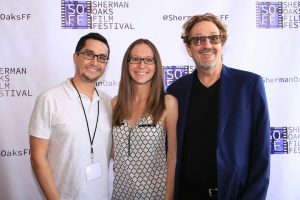 “The Faceless Man” director/writer Jeremy Foley, producer/writer/editor Sara O’Reilly, and sound designer/mixer Mike LaFerla. 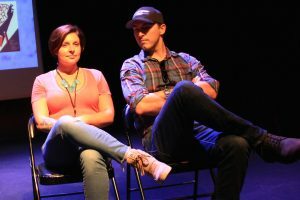 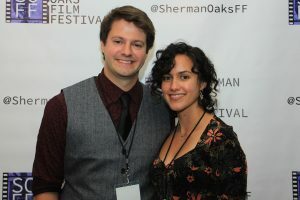 “The Faceless Man” producer/writer/editor Sara O’Reilly and director/writer Jeremy Foley. 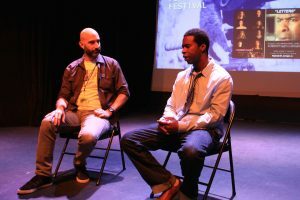 Q&A with “See Yourself Out” writer/director Kevin Nielsen. 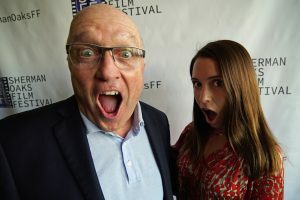 “Mouse Mess” lead actor Annica McCrudden and filmmaker Miles McCrudden. 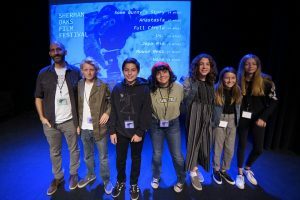 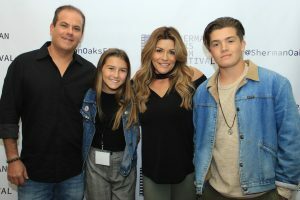 Remy Boul, Ella Mazer, Ella Warner, Isabella Masrouga, Miles McCrudden, and James Labuda; the filmmakers from CAAM, the Cinematic Arts Academy at Millikan Middle School. 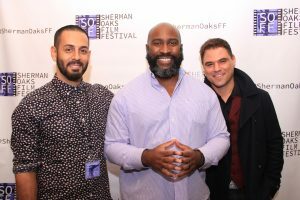 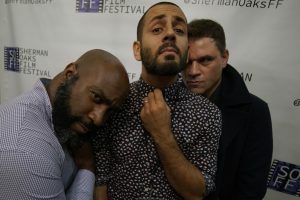 “Immersion” writer/director Mikhael Bassilli, executive producer Brandon Miree, and lead actor Troy Mittleider. 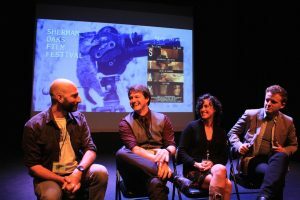 Q&A with “I Cherish Women” filmmaker Judith Lynn Stillman. 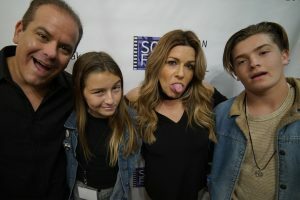 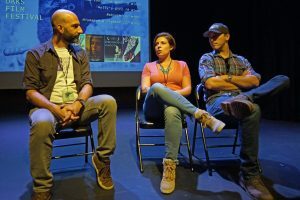 Adam Mazer, “Hope” filmmaker Ella Mazer, Allyson Mazer, and filmmaker Jonah Mazer. 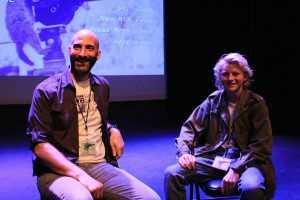 Q&A with “Full Circle” filmmaker James Labuda. 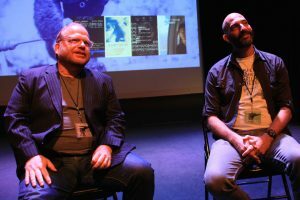 Q&A with “From Ashes to Immortality” filmmaker Eric Hyde. 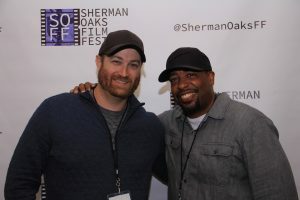 “Chatsworth” location manager Matt Muchka and writer/director La Monte Edwards. 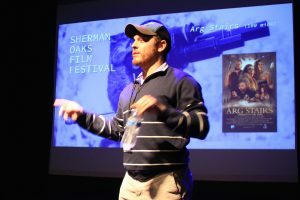 “Arg Stairs” filmmaker Kyle Romanek holding a raffle for free stuff! 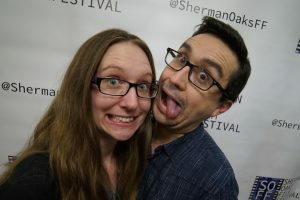 A friendly choking of “A Scream That’s Trapped Inside” writer/director Savvas Christou. 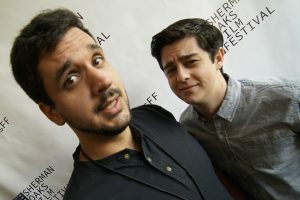 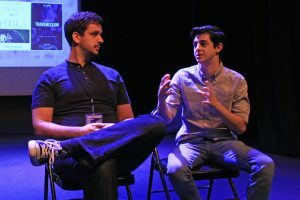 Q&A with “A Meditation” writer/director Joe Petricca. 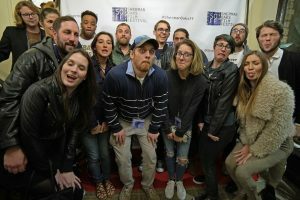 The team behind the feature length caveman adventure/comedy “Arg Stairs” getting silly. 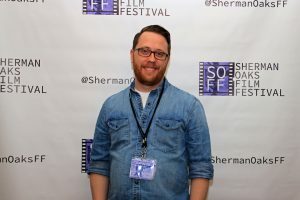 “Full Circle” filmmaker James Labuda. 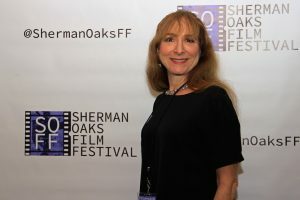 “I Cherish Women” filmmaker Judith Lynn Stillman. 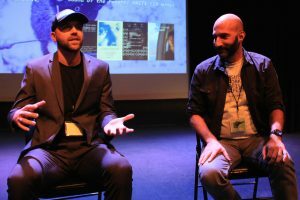 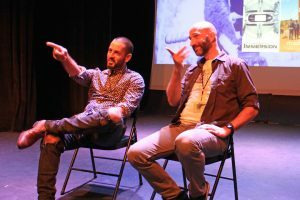 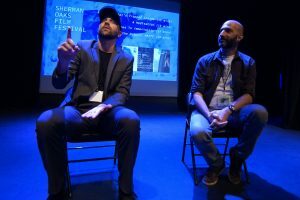 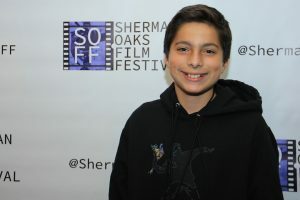 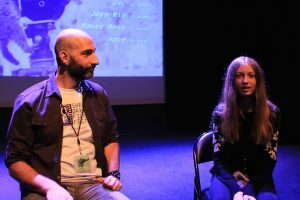 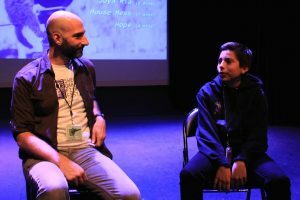 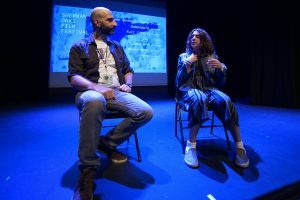 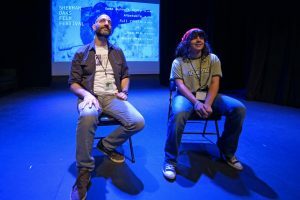 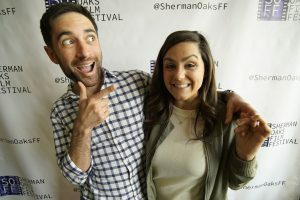 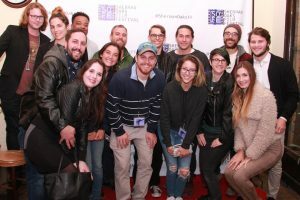 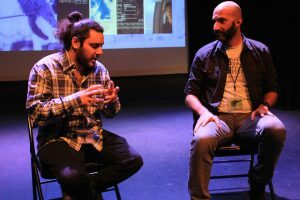 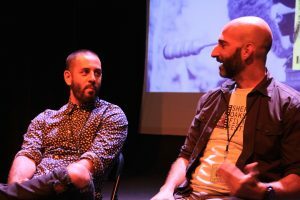 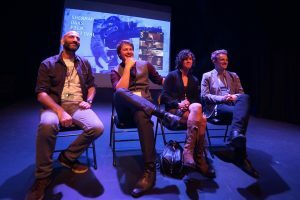 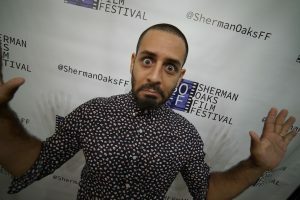 Q&A with “Immersion” writer/director Mikhael Bassilli. 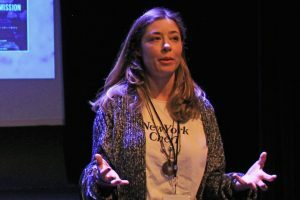 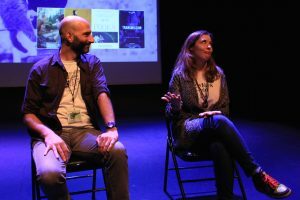 “Joya Mia” filmmaker Ella Warren (left). 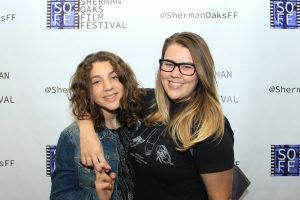 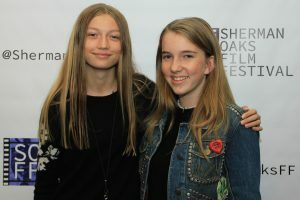 Filmmakers Ella Mazer and Isabella Masrouga. 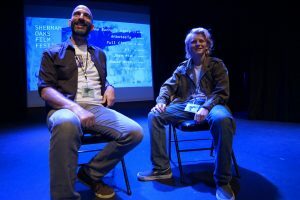 Q&A with “Mouse Mess” filmmaker Miles McCrudden. 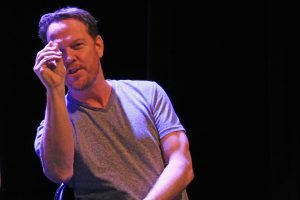 He’s already doing “director hands” perfectly. 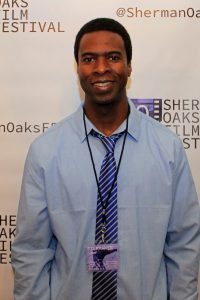 “See Yourself Out” writer/director Kevin Nielsen. 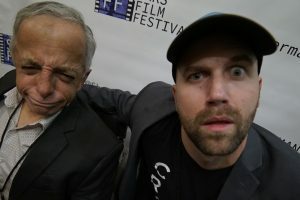 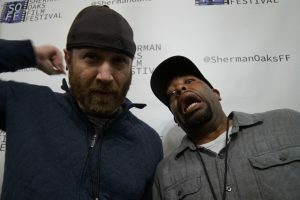 The silly pic with “Stay” actor Blake Berlin, friend, and writer/director Christopher Cramer. 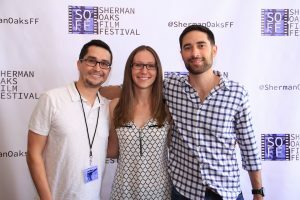 “The Faceless Man” director/writer Jeremy Foley, producer/writer/editor Sara O’Reilly, and “based on the story by” Jeremiah Foley III. 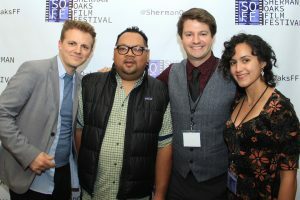 “Tirachinas” lead actor Emma Maddock, writer/director Pedro Patricio, and fellow filmmaker Fei Yu. 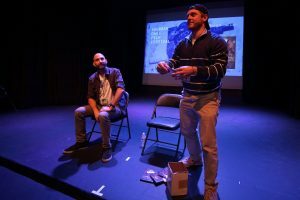 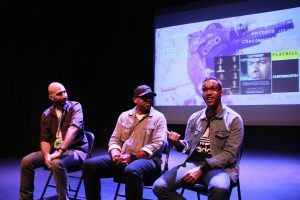 Q&A with “Us.” director and animator Remy Boul. 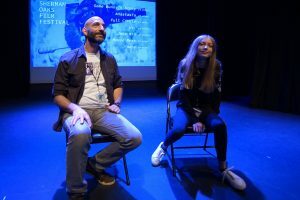 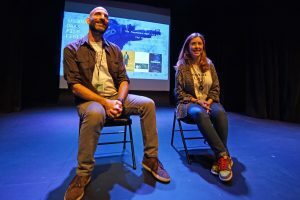 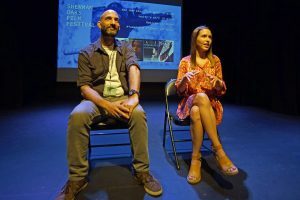 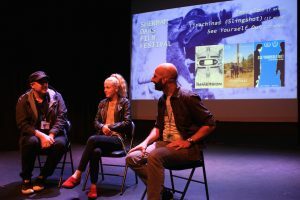 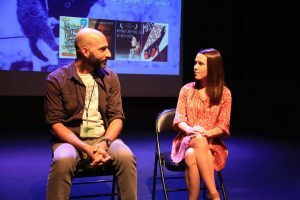 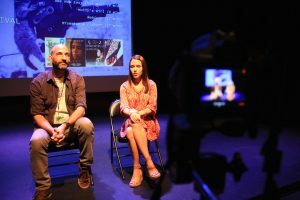 Q&A with “Tirachinas” writer/director Pedro Patricio and lead actor Emma Maddock. 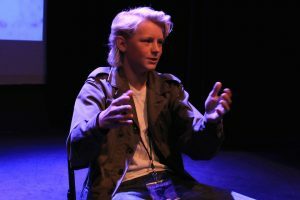 Q&A with “The Faceless Man”lead actor William O’Leary. 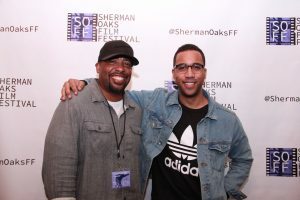 “Stay” writer/director Christopher Cramer and lead actor Devin Brooke. 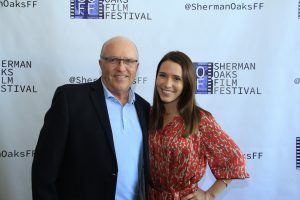 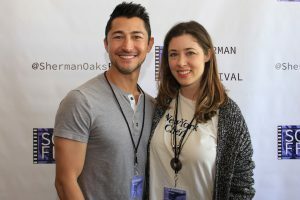 Lead actress Natalie Sifferman of “Rebirth” with her father. 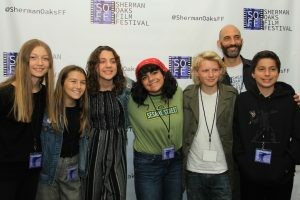 Remy Boul, Ella Mazer, Ella Warner, Isabella Masrouga, Miles McCrudden, SOFF programmer Jeff Howard, and James Labuda; the filmmakers from CAAM, the Cinematic Arts Academy at Millikan Middle School. 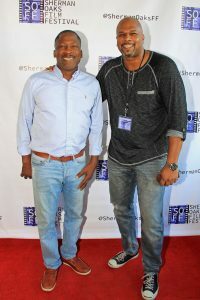 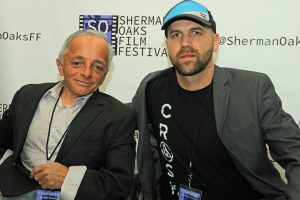 “Chatsworth” writer/director La Monte Edwards and lead actor Michael Dearie. 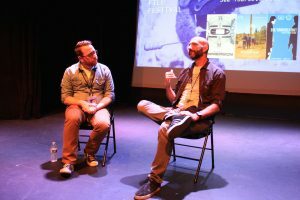 Q&A with “Arg Stairs” filmmaker Kyle Romanek. 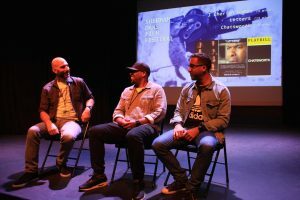 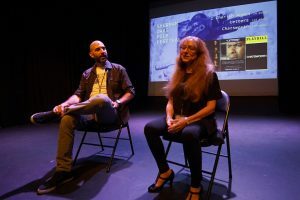 Q&A with “A Scream That’s Trapped Inside” writer/director Savvas Christou. 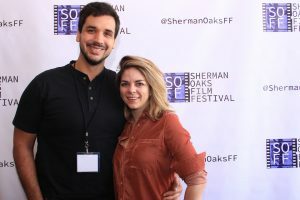 “Arg Stairs” actor Alexandra Hvrinak and director Kyle Romanek. 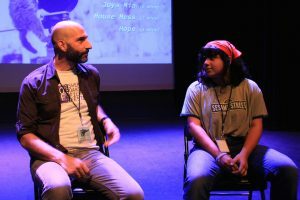 Q&A with “Hope” filmmaker Ella Mazer. 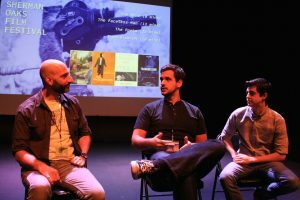 “Immersion” executive producer Brandon Miree, writer/director Mikhael Bassilli, and lead actor Troy Mittleider. 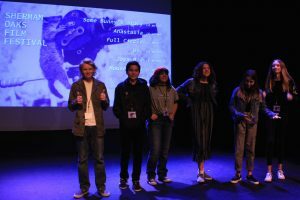 Programmer Jeff Howard with the filmmakers from CAAM, the Cinematic Arts Academy at Millikan Middle School: Miles McCrudden, James Labuda, Isabella Masrouga, Ella Warner, Ella Mazer, and Remy Boul. 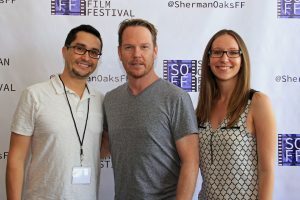 “One More” writer/director Nate Hapke. 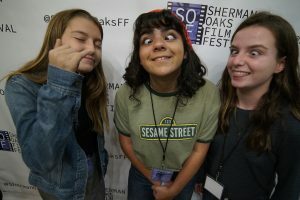 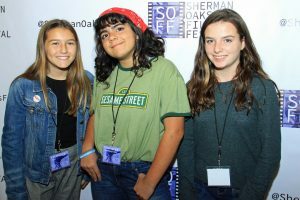 “Hope” filmmaker Ella Mazer, “Some Bunny’s Story” filmmaker Isabella Masrouga, and friend. 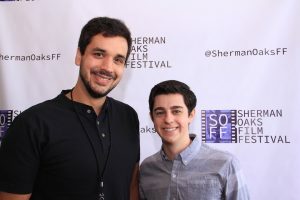 “Stay” actor Blake Berlin, friend, writer/director Christopher Cramer, and lead actor Devin Brooke. 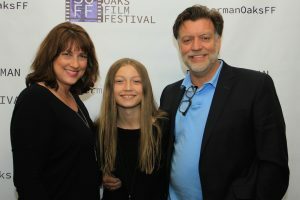 “Us.” director and animator Remy Boul with her parents. 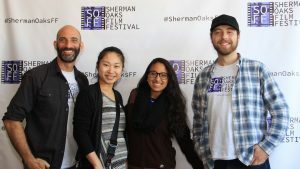 SOFF staff members Jeff Howard, Angela Liu, Amaris Gagnon, and Jeff Simpson. 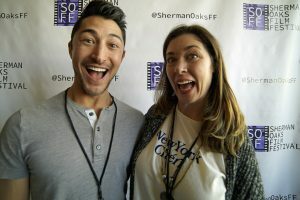 SOFF staff members Andrea Levenson & Jeff Howard.